For some, the date April 15 is a stressful date on the calendar. Not for Kerry. For Kerry, April 15 marks the day he left the streets. Kerry’s life has undergone dramatic change in the last few years—and he has you to thank for it. He once slept at Higher Ground Minneapolis’ predecessor, Secure Waiting, then when Higher Ground opened in the summer of 2012, he moved to the second floor, to the Pay for Stay. The transition from Secure Waiting to Higher Ground made a marked difference in Kerry’s life. “Higher Ground gave me a lot of confidence in myself and helped me physically and mentally. I got stability at Higher Ground,” he said. 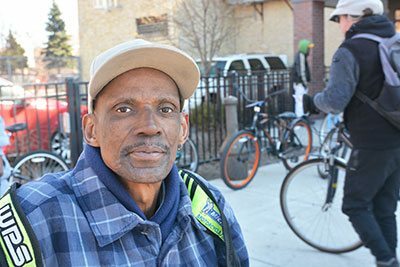 In Pay for Stay, Kerry paid about $40 a week for his bed on the second floor of the Minneapolis shelter. Those funds were set aside to assist Kerry when he moved onto an apartment. He enjoys his 11th Avenue apartment near downtown Minneapolis. Money is tight, but Kerry doesn’t complain. He often returns to Catholic Charities’ Opportunity Center for meals, to meet with his housing counselor and for fellowship. “The system will help you if you want to help yourself. They see you helping yourself and they help you. I am so thankful to Catholic Charities and to Hennepin County for helping me,” he said. Once, it was a good day when Kerry had a place to sleep at night. Now, Kerry says a good day includes a bike ride down to the river where he can sit outside and immerse himself in a paperback novel. He’s not looking back, but looking forward to his next homecoming anniversary. “I have too much confidence in myself now, I think I’m strong enough and stable enough to never be homeless again,” he said.